Shoot mini basketballs into the hoops, and test your skill. 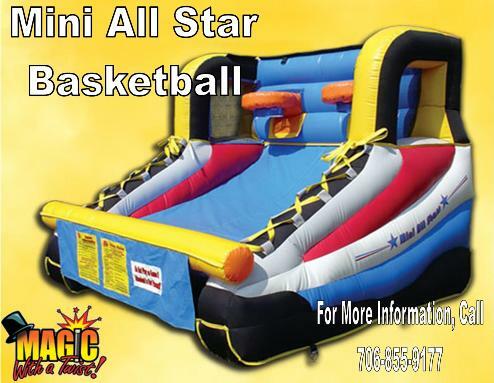 Make it double the fun and challenge someone else to a head-to-head slam-dunk match. Two players race each other and the clock in this fast-paced basketball game combining speed and accuracy. Players attempt to score as many baskets as possible. This game is 9� 4� wide by 9� 7� long and 7� 8� tall. This game is suitable for all ages. The Mini All Start requires a relatively flat area about 12� x 12' and within 100' of an electrical outlet. We prefer to set the inflatable up on grass. Please make sure all sticks, rocks and dog waste are cleared from the area before we arrive, to avoid delay in setting up for your event.